We love the children at NLC! On the 1st and 3rd Sunday mornings of the month, the children go to Sunday School right after morning worship. They participate in age appropriate lessons, crafts, and games. 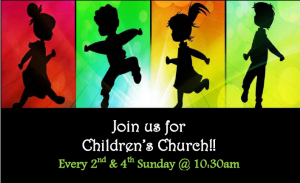 On the 2nd and 4th Sunday morning of the month, the kids have an exciting time in Children's Church. Children's church is a fun time of worship, games, teaching and preaching that is geared toward the kids. The children love to come together to worship the Lord in a kid centered environment. They are encouraged to give testimony, memorize scripture, bring their friends to church and earn rewards for good behavior and participation. Our kids look forward to going to Sunday School and Children's Church to dive deeper into the word of God. They are discovering and exploring his promises while growing closer to him each day.